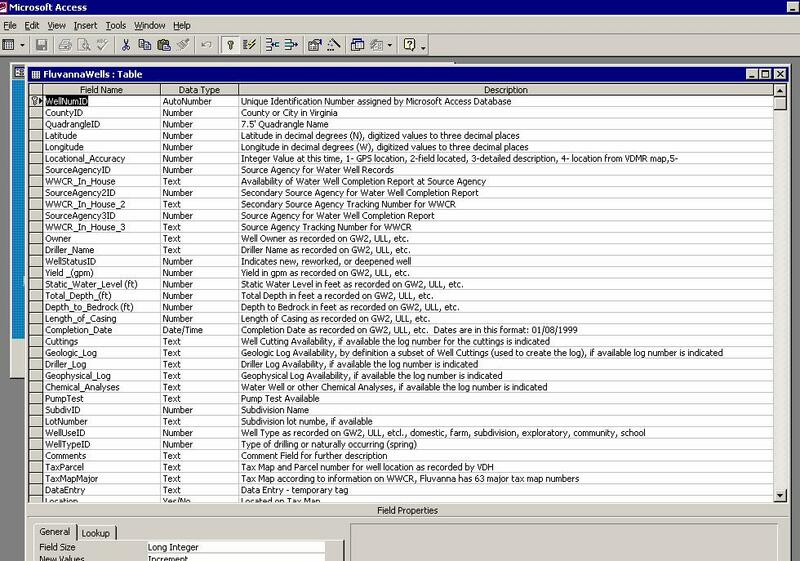 In 2001, Michael Collins, while employed at ENSAT Corporation, and Nick Evans, while working at the Virginia Department of Mines, Minerals, and Energy, working with colleagues John Rice, Mike Maloy, Vincent Day, Mark Harper, Andrew Carter, Vincent Dish, and Dave Hirshman at Albemarle County, directed a groundbreaking hydrogeologic study of the Mechums River and Ivy Creek watersheds in Albemarle County, Virginia. The study created hydrogeologic units within these watersheds and for each, determined “groundwater availability for individual wells” and “groundwater availability for community wells” . The degree of background fracturing in the bedrock. Michael Collins and Nick Evans collaborated with many non-profit and state organizations to complete the Rivanna River Basin Project, documented in the 1998 Rivanna State of the Basin Report. The Rivanna River Basin Project was initiated by the Thomas Jefferson Planning District Commission (TJPDC) to assess past and current conditions of the Rivanna River and its tributaries and to articulate desired futureÂ conditions. The Rivanna River Roundtable (RRR) was selected by the TJPDC to develop the project. The Roundtable included twenty-four members from all parts of the Rivanna Watershed, representing all the political jurisdictions and a wide variety of stakeholders – farmers, developers, designers, environmentalists, educators, scientists, preservationists, historians, and authors. In addition, the Environmental Education Center formed Field Teams of interested citizens to monitor water quality in the River and its tributaries. Nick Evans and Michael Collins worked with local and regional governments in Central Virginia to develop relationships between geology and Virginia Department of HealthÂ groundwater completion reports. Nick Evans directed a detailed analysis of water resources in Fluvanna County, Virginia. Note: The toxicity of pesticides was not considered in the evaluation of contamination potential. Findings from this project are available at the Thomas Jefferson Planning District Commission in Charlottesville, Virginia. Michael Collins, working with Nick Evans and colleagues at Virginia Tech and other agencies, produced pollution potential mapping for Louisa, Nelson, and Greene Counties. Findings from this project are available at the Thomas Jefferson Planning District Commission. The Center for Sustainable Groundwater (CSG) works in partnership with Virginia Groundwater, Conserv, and other companies, organizations, and universities on sustainable groundwater projects and programs. Our primary focus is international work in areas with similar hydrogeologic regimes to that found in the mid-atlantic piedmont. In these settings, we work with governments and NGOs to not only develop groundwater supplies, but also to ensure sustainable management of the resource. Specifically for the karst geology found in the County, a hybrid hydrogeologic mapping technique was used to delineate potential recharge areas. Volunteers were trained to undertake reconnaissance surveys for potential contaminant-causing activities within the potential recharge areas. For this work,Â Shenandoah County and the Water Resources Advisory Committee received awards fromÂ EPAÂ and theÂ Lord Fairfax Soil and Water Conservation District. Conserv-Marketplace for Ecosystem Restoration, working with The Center for Sustainable Groundwater, and Virginia Groundwater, LLC, have completed the study Underground Albemarle Revisited: The Role of Groundwater Ecosystem Services in Determining an Optimal Sustainable Population Size for the Charlottesville/Albemarle Community. The study was prepared for the non-profit organization, Advocates for a Sustainable Albemarle Population (ASAP). The purpose of the study is to consider how groundwater management policy impacts optimal sustainable population size (OSPS) in Albemarle County and The City of Charlottesville, Virginia within an ecosystem services framework. The specific research question explored in this paper is – Does groundwater availability impact the determination of an optimal sustainable population size in Albemarle County and the City of Charlottesville and if so, what is that impact? The study embraces a holistic approach to exploring linkages between human population, land use, surface water and groundwater resources. 1. New language has emerged in recent years to describe responsible stewardship of groundwater resources. Bedrock fractures are not uniformly distributed, even within the same rock-type on a small parcel of land, and are not always interconnected in a horizontal sense. Thickness and water storage and transmission capacity of saprolite (the near-surface sponge composed of weather bedrock) vary from place to place, even within the same rock type. In some geologic settings, the only water available for water supply wells exists in the soils and saprolite, above bedrock. Recharge to water-bearing zones in the saprolite and the bedrock may be very local in settings where both hydraulic gradient and interconnectivity among fractures are low. This means that in some situations, recharge may be affected much more by land cover changes in the immediate vicinity, than by activities that take place farther away. 3. The conceptual foundation of sustainable groundwater management is that demand for non-extractive groundwater services receives priority over fulfilling demands for extractive groundwater services. The maximum amount of groundwater that can be sustainably pumped from the ground is the volume left over after non-extractive groundwater needs have been satisfied. 4. The County’s previous groundwater studies and groundwater policy have been focused on extractive groundwater services. The 2003 availability report (ENSAT Corporation and others, 2003) focused on absolute amounts of groundwater that occur in different parts of the county, capable of being “captured” for human use by drilling a well.Â It should be noted, however, that language in support of non-extractive groundwater services can be found in non-groundwater specific County policy, such as the Introduction to the Natural Resources Chapter of the Comprehensive Plan (Albemarle County, 1999). 5. Stream ecosystem health can be used as a proxy for non-extractive groundwater services, and an indicator for sustainable groundwater management. The percentage of impervious land cover that is a threshold for onset of degradation of stream ecosystem health can be used to quantify the percentage of recharge required to supply non-extractive groundwater services. Locally, the degradation threshold appears to be in the range of 5 to 20% impervious land cover.Â In terms of groundwater recharge, the threshold of degradation to stream ecosystem health can be estimated at diminution of recharge by 5 to 20%.Â It follows that 80 to 95% of natural recharge is required to fulfill non-extractive groundwater services.Â This means that 80 to 95% of recharge must be left in the ground, and that a maximum of 5-20% of groundwater recharge in Charlottesville and Albemarle County can be used for extractive groundwater services. 6. The amount of groundwater available on a given parcel to provide for both extractive and non-extractive services varies as a function of hydrogeology, topography and land cover. There are settings within the study area where groundwater recharge and flow across a given parcel are very large relative to the volume of groundwater needed for non-extractive services.Â In these settings, it is theoretically possible to sustainably pump significant quantities of water from the ground, and apply this water to a consumptive use where water is transported away from the local watershed.Â In other areas, groundwater flow and recharge are limited by hydrogeology and other factors.Â In these areas, the volume of water available for sustainable extraction may be relatively small. Albemarle County contains two recognizable zones of high potential for significant sustainable groundwater extraction, and one recognizable zone of low potential (Figure 5, above).Â The remainder of the County and the entire City are within a zone characterized as having mixed potential.Â Within this area, site-specific study will be required to identify zones of high or low potential, to the extent that such may exist. 7. The use of groundwater for residential needs in the rural area of Albemarle is non-consumptive, in the sense that most of the water is returned to the ground after use via a sanitary drainfield. Therefore in most cases, under current 2-acre minimum lot size zoning, domestic groundwater use in the rural areas of the county does not degrade non-extractive services, and is generally sustainable, regardless of hydrogeologic setting. 8. Sustainable groundwater management has implications for sustainable population size. Under sustainable groundwater management, 80-95% of groundwater recharge is left in the ground to provide for non-extractive groundwater services.Â Simply stated, this means that under sustainable management, over the long-run, the great majority of groundwater is unavailable for extractive consumption by humans. This would seem to imply that the size of the community’s “sustainable” population may be less than-as presumed in previous assessments of water availability-if all available groundwater were to be extracted to supply human needs. On the other hand, the impact of sustainable management (or lack thereof) could be particularly significant should Albemarle’s EBRF and MRFZ be utilized for groundwater supply. For example, rather than the 3.9 to 7.8 MGD estimated to be available for extractive services from the EBRF under a sustainable groundwater management regime, approximately 39 to 78 MGD could theoretically be pumped, in the short-term, to facilitate commensurate population growth above and beyond what is sustainable relative to protection of non-extractive groundwater services. The results of unsustainable groundwater mining such as this could be widespread lowering of the water table, causing elimination of base flow in many streams and landscape-scale desertification. Â This has the potential to drastically alter quality of life, and disrupt the local food supply, among other implications for the resident human population. 9. Sustainably managed groundwater could provide a significant proportion of future water needs for the City of Charlottesville and urban areas of the County. 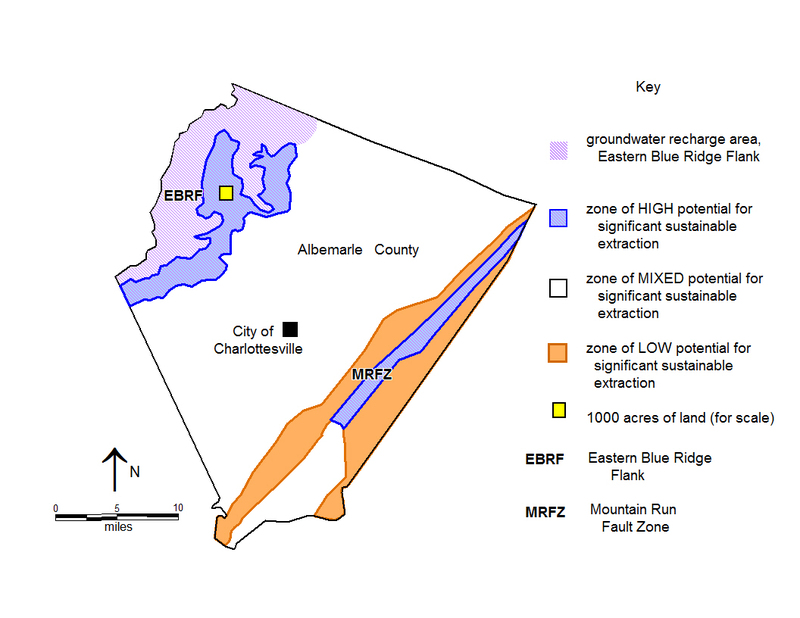 Sustainable groundwater extraction from the Mountain Run Fault Zone (MRFZ) and Eastern Blue Ridge Flank (EBRF) could have a significant impact on maximum sustainable population size for the area. The study can be downloaded from the link below.